Indira Gandhi National Centre for ihe Arts (IGNCA). an autonomous organization under the Ministry of Culture. 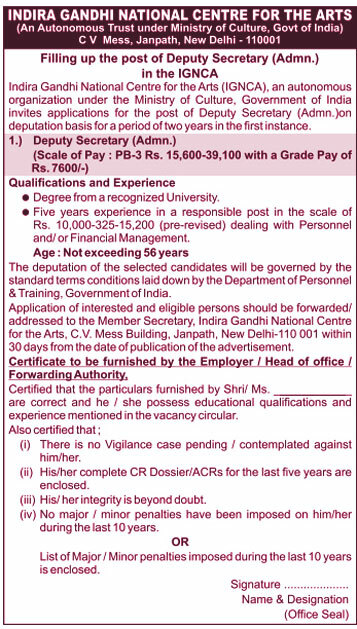 Government of India invites applications for the post of Deputy Secretary (Admn. )on deputation basis for a period of two years in the first instance. • Degree from a recognized University. The deputation of the selected candidates will be governed by the standard terms conditions laid down by the Department of Personnel & Training. Government of India. Application of interested and eligible persons should be forwarded/ addressed to the Member Secretary. Indira Gandhi National Centre for the Arts. C.V. Mess Building, Janpath, New Delhi-110 001 within 30 days from the date of publication (19.10.2010) of the advertisement.